Test flights of an AN-124-100M-150 aircraft equipped with new tyres developed by the UK company Dunlop Aircraft Tyres were performed at the Flight Test Base of ANTONOV Company. 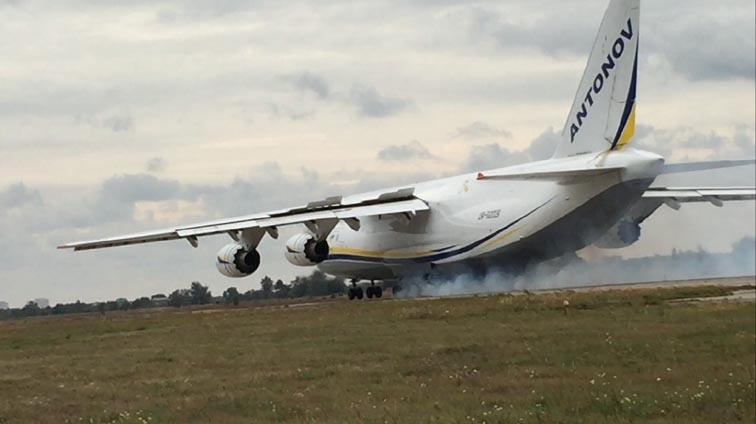 ANTONOV Company intends to equip the fleet of Ruslans and AN-225 Mriya of Antonov Airlines with the tyres. The test programme included flights with take-off weights of 340t, 360t and 402t with different CG limit positions. The take-offs and landings were performed within the limits of expected operational conditions. All the tests were conducted in the presence of Dunlop Aircraft Tyres specialists, including Martin Pye, director of original equipment business. The tests confirmed the high quality of the tyres, developed by Dunlop Aircraft Tyres especially for superheavy Ruslan and Mriya on the request of ANTONOV Company. “We have a good experience of cooperation with Dunlop Aircraft Tyres, the world’s only dedicated manufacturer and retreader of aircraft tyres, thorough our partnership on the AN-148/AN-158 programme. Our cooperation on Ruslans with new tyres also started successfully, asconfirmed by the results of the tests. Advantages of Dunlop Aircraft Tyres products includs authorization by EASA and competitive prices” – noted Oleksandr Kotsiuba, President of ANTONOV Company.